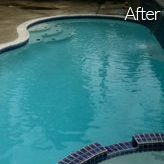 Do you have a pool that needs cleaning? 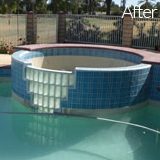 Sparkling clean tiles make your pool come alive, while scaly damaged tiles can make even the most expensive of pools look cheap! 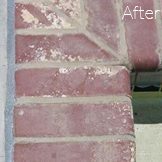 Pool Rehab can locate the same tiles for you, and if that’s not possible, we can always find a way to use tiles in a way that either complements or blends well with the existing tiles. 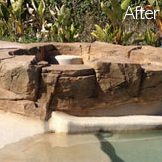 Synthetic rockwork is very common in backyard pools, but the paint, which is used to replicate natural color of rocks, tends to fade away with time. While these sealants are pretty resilient, they tend to lose their strength over the years. Acid washing your pool every few years is an excellent way to keep stains off the pool tiles. We look forward to servicing you in rock paint service and more. I thought for sure our tile had had it and we would have to replace it. 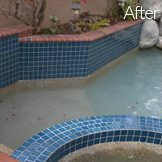 Pool Rehab did an amazing job and restored it back to the way it was when it was new. The tile looks AMAZING. Very professional and very easy to deal with, and we love the idea of the maintenance program. It makes it very affordable to keep it looking new all the time. Pool Rehab specializes in restoring your swimming pool back to its old glory!